Model Name: Cosmograph Daytona "Big Red"
Clasp/Buckle: Stainless steel Rolex deployant clasp stamped "H" and "78350"
Accessories: Accompanied by unnumbered Rolex Guarantee, sale tag, fitted presentation box and outer packaging. 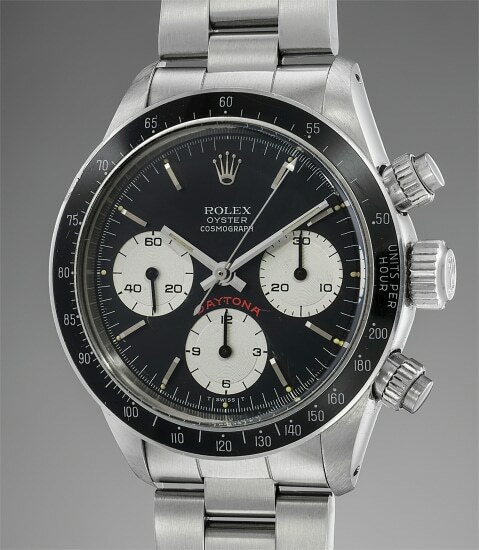 Reference 6263 can be arguably considered the most iconic of the manually-wound Daytona models. Launched in the early 1970s and in production until 1987, it is defined by the screw pushers and the bezel with black acrylic insert. Such configuration has proven so timeless that the new Daytona model released in 2017 amply borrows its case/bezel design indeed from ref. 6263. The present specimen is defined by its “Big Red” dial. The final evolution of the manual Daytona dial, it is found on the last specimen of reference 6263 (and its metal-bezel brethren 6265) and is characterized by a very prominent Daytona designation above the 6 o’ clock subsidiary dial in bright red ink. The present specimen is blessed with what can be considered a virtually flawless dial, and the condition of the case perfectly match that of the face: extremely sharp and well preserved with only minor signs of wear.